This crucifix dial is one of the two known instruments signed by Melchior Reichle, the other being a compendium (Epact 37591). 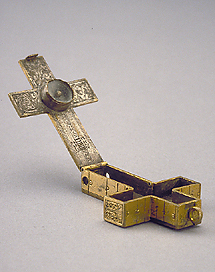 Crucifix dials were frequently engraved with scenes from The Calvary. An unusual feature in this example is the small sliding rulers on the back, used to convert common and Italian hours.